Seeking to represent both the real and redefined beauty of women in contemporary society, Australian artist Lilli Waters presents ANJA – a diverse photographic series featuring everyday women at red gallery from 12 August 2015. ANJA confronts the fears and stigmas associated with the perceptions of women’s bodies in today’s world of unrealistic and idealised standards of how women should look. Waters does not aim to sexualise the female form, but instead strives to find self-compassion and emotional awareness both in herself and in her audience. “Photographing these women helps me in the search for that, and perhaps, helps the subjects to find a moment of self-acceptance and recognition, which is deserved and should be encouraged much more within our culture,” said Lilli Waters. An Australian photographer based in Melbourne, Lilli Waters seeks to present not only an evocative image, but a strange and sometimes dark narrative, an intermingling of haunting backgrounds and landscapes combined with romantic notions. Her first solo exhibition, She Raw was displayed in the Black Dot Gallery in 2012. ANJA is her second solo exhibition. Waters was recently announced a semi-finalist in the 2015 Head On Portrait Prize. 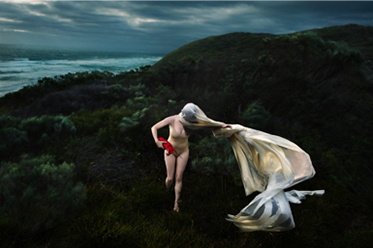 Lilli Waters’ first solo exhibition, She Raw was displayed in the Black Dot Gallery in 2012. All images from the exhibition will be published in a book with 50% of profits going to the White Ribbon Foundation, which aims to combat male violence against women. For more information visit: www.redgallery.com.au or www.lilliwaters.com for details.